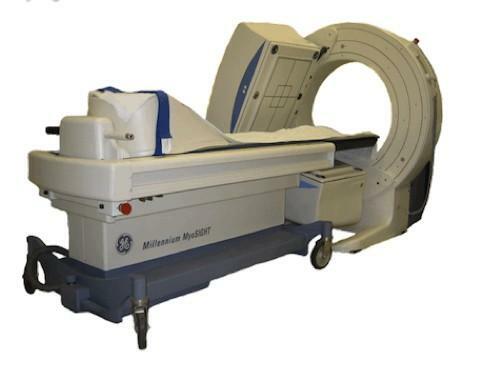 In 2013, GE issued its first recall of several nuclear imaging systems after they received news of a patient’s death caused by a portion of a SPECT/CT scanner that fell during the scan. Nuclear imaging cameras can weigh upwards of a thousand pounds as they are lined with lead. After examining the device, GE Healthcare determined the incident had been caused by loose bolts securing the camera to the gantry, which over-stressed its support system and led to the fall. Shortly after the first recall, because their engineers recognized similarities in the design of support systems across almost all of GE Healthcare’s SPECT and SPECT/CT imaging systems, the company issued a second recall which included the majority of their nuclear imaging systems: Infinia Nuclear Medicine Systems, VG and VG Hawkeye Nuclear Medicine Systems, Helix Nuclear Medicine Systems, Brivo NM615, Discovery NM630, Optima NM/CT640, Discovery NM/CT670. The affected products were distributed between October 1992 and June 2013. In 2018, a similar incident occurred when the top detector of GE Healthcare’s Millennium Nuclear Medical System detached and fell onto the detector below. Although no patient injuries have been reported thus far, there is a life-threatening risk if the detector were to detach and fall on the patient during an exam. The FDA has responded by ordering a Class I recall. According to the FDA, GE Healthcare has determined that the incident was caused by an improperly functioning primary motion stopper and a missing mechanical stopper which would limit the detector’s travel beyond its limits during normal operation. All Millennium MG, Millennium MC and Millennium Myosight Nuclear Medical Systems manufactured between January 1997 and July 2012, and distributed between January 1997 and September 2018, are to be included in the recall – a total of 996 devices. GE Healthcare has also sent customers an “Urgent Medical Device Correction Letter” urging them to refrain from using these systems until the company can complete a full inspection of all systems. Following their inspection, GE Healthcare announced that no related issues were found among their imaging systems.